Do you like trading the news but can't be at your trading machine around the clock? With this EA you can place all your news trades for the entire week in advance. Load the EA onto the chart, press a button to tell it what day to trade; press another couple of buttons to select the hour and minute that you want the POs to be placed. Repeat for as many Forex pairs as you like (having a template makes it even quicker), for Monday to Friday, then let the EA do the trades for you. We've been using it on our live accounts since late 2014, with the likes of NFP and and FOMC, as well as other big news events from around the globe. The results have been terrific, e.g. : 10% account increase on NFP release 5th June 2015 and 11% on FOMC 16th June (past results are not indicative of future results - some news releases might result in a loss so trade only what you can afford to lose). Of course it helps if you have a reliable broker that doesn't widen the spread a ridiculous amount or impose massive slippage, plus offers reliable fills. It also helps if you have a good VPS, so you don't need to leave your computer running all the time: we use LinkUpHost and have been extremely happy with their reliability and support. The picture below shows an example of three different news trades being set up (just an example) ... The first one is for today at 16:00 (local time or 18:00 broker time) to place a long PO, one minute before the news (though there isn't really news today - just continuing with the example). 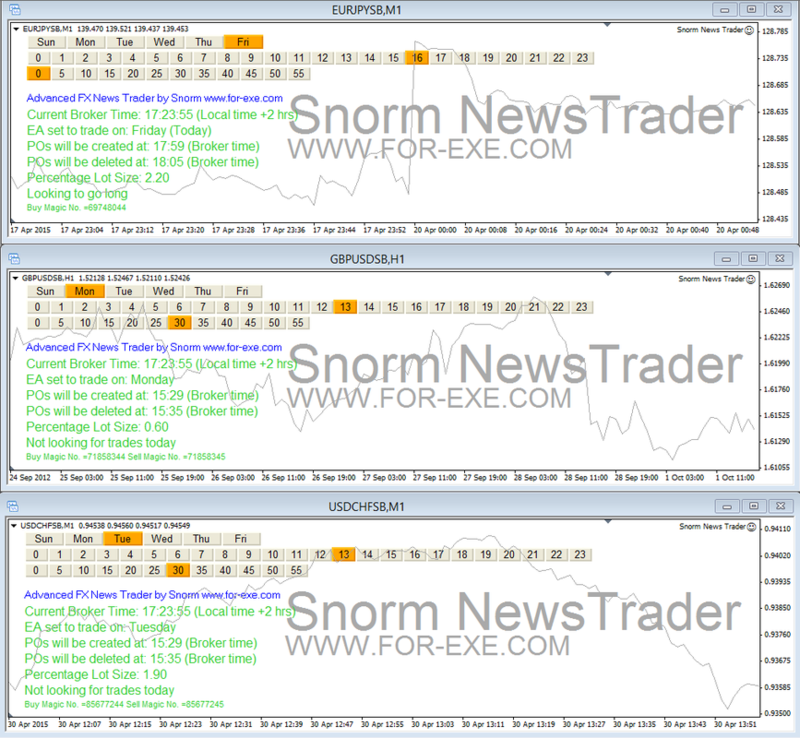 The next two charts show trades for Monday and Tuesday at 13:30. ​A single licence allows you to run the News EA on one broker account, on as many computers as you wish; or, you can have a PC_Code licence which allows you to run with multiple accounts on the one computer - for the same price. We can create a PC_Code licence on request. Additional licences will be required if running multiple accounts on multiple computers - a discount is available for additional licence purchases for your own use.